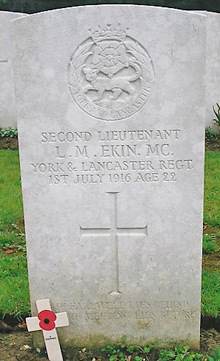 2nd Lieutenant Leslie Montrose Ekin M.C. Leslie Montrose Ekin and James Ekin were the sons of Mr. James Ekin and Mrs. Josephine Alice Ekin of De Walden Court, Eastbourne London. He joined the Inns of Court O.T.C. and received his commission in December 1914. He was attached as a machine gun officer to the York and Lancaster Regiment. 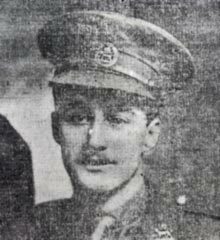 On 1st July 1916 as the two brothers led their men across ‘No Man’s Land’ and, though seriously wounded, Leslie managed to hold his line of advance with his machine gun team, then taking control of the gun himself before he was cut down. For his bravery he was awarded the Military Cross. Today the two boys lie less than a mile apart in France. Leslie was 22 years of age. Authuile (now Authuille) and Aveluy are villages 4 kilometres north-east of the town of Albert. The Cemetery is situated in a valley half way between these two villages on the D151 (Cemetery is signposted on exit of Aveluy direction Authuille). The Cemetery is on the eastern side of the road D151 and access is 500 metres by grass pathway (unfit for cars). 6 FindAGrave.com Gravestone photo of 2nd Lieutenant Leslie Montrose Ekin M.C.